Harare (formerly known as “Fort Salisbury” or “Salisbury”) is the largest city in Zimbabwe with a population of 1.6 million. It serves as Zimbabwe’s seat of government and Zimbabwe’s commercial and industrial center. The city is located in Northern Zimbabwe in the region of the Shona speaking people. Cecil Rhodes and the British South African Company (BSAC) founded the settlement as “Fort Salisbury” on September 12, 1890. The fort began when the BSAC’s Pioneer Column, under the command of Major Frank Johnson, invaded Shona territory and seized land held by the Shona and other indigenous groups. Britain recognized the fort as a colonial municipality in 1897 and in 1923 the settlement became the capital of the Rhodesia Colony which then included both Northern and Southern Rhodesia. In 1953 Salisbury became the capital of the newly forged Federation of Rhodesia and Nyasaland which includes the contemporary nations of Zambia, Zimbabwe, and Malawi. After the collapse of the Federation in 1963 Salisbury remained the capital of Southern Rhodesia. In addition to being an administrative hub, Salisbury served as a major economic center for Southern Rhodesia. Initially British settlers, who were a minority in both the capital and the nation, focused on small-scale farming and gold mining in the area. After World War II light iron production, steel production, textile manufacturing, paper production, and vehicle assembly were introduced to the city. Also, by the 1950s the number of British residents increased significantly and a university and new airport were established. In Salisbury the British denied black residents their civil rights. Africans were barred from downtown areas and relegated to segregated neighborhoods called “locations.” White settlers controlled Salisbury’s economic, social, and political institutions. Racial inequity triggered strikes by African workers in the 1940s, bus boycotts in the 1950s, and major anticolonial uprisings in the 1960s. In 1960, at a protest called the March of 7,000, a young Robert Mugabe addressed the crowd about Black Nationalism. With that address and his later imprisonment by British colonial authorities, he emerged as one of the leaders of the anti-colonial movement. The Zimbabwe quest for both independence and majority rule continued well into the 1970s. In 1974 Mugabe, now released from prison, became president of the Zimbabwe African National Union (ZANU), a key political party advocating for black independence. It worked alongside but also competed with another political party, the Zimbabwe African People’s Union (ZAPU) founded by Joshua Nkomo, which espoused similar goals. In 1980 Southern Rhodesia gained independence from Britain and was renamed the Republic of Zimbabwe. In 1982, on the two-year anniversary of Zimbabwe’s independence, the government renamed Salisbury “Harare” in honor of the Shona-speaking “Harare” people who lived in a nearby settlement before British rule. The capital, Harare, continued to serve as a political, economic, and cultural hub for Zimbabwe. In 1987 Robert Mugabe became president of Zimbabwe. Under his administration African migrants to Harare increased dramatically but massive unemployment and inflation became a reality for city residents. 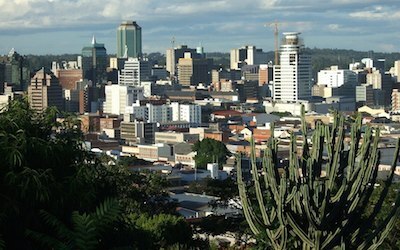 Many members of the international community blamed Mugabe’s economic policies and political corruption for the city’s poor economic performance. The governing council of Harare consists of the following: a mayor, deputy mayor, 46 elected councilors, and 12 appointed councilors. Harare is home to many notable institutions in Zimbabwe such as the National Archive, the National Gallery, the Zimbabwe Museum of Human Sciences, the Harare International Airport, and the University of Zimbabwe. Because of the city’s colonial past it maintains a distinctly British influence in its architecture and urban layout. “Harare,” New Encyclopedia of Africa, editors John Middleton and Joseph Miller (Detroit: Charles Scribner’s Sons, 2008); "Robert Mugabe," Contemporary Black Biography, Vol. 71 (Detroit: Gale, 2009); Mary Johnson Osirim, Enterprising Women in Urban Zimbabwe: Gender, Microbusiness, and Globalization (Washington, D.C.: Woodrow Wilson Center Press, 2002); Oyekan Owomoyela, Culture and Customs of Zimbabwe (Westport, CT: Greenwood Press, 2002). (Westport, CT: Greenwood Press, 2002).